Situated about one mile (1.5kms) north of Viti Levu, is the little island of Nananu-i-ra. 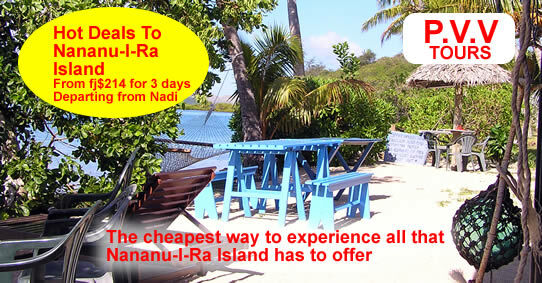 For such a small island, Nananu-i-ra has a great selection of accommodation choices for those on a limited budget. There are 4 establishments, all within easy walking distance of each other. Macdonalds, Bethams, Charlies Cottages, and Safari Lodge (we are not including the more expensive resort, on the north western tip of the island. That is closed down indefinitely). If you want to read more about the accommodation choices, we have a full write up of each place, see links further down on this page. We have also included Golden Point, which is in close proximity to Nananu-i-ra. Three of the establishments are nestled in a sandy cove on the leeward side of the island (Naivere Bay), so offer calm sheltered beaches that are great for swimming and snorkeling. Safari lodge is on the windward side (only a 5-10min walk across the island) and the trade winds here mean fantastic windsurfing and kite-boarding. Roughly midway between Nadi and Suva on the Kings highway, lies the coastal township of Rakiraki. This is the departure point for the short boat ride to Nananu-i-ra. Boats from the island will pick up and drop off at Ellington Wharf. 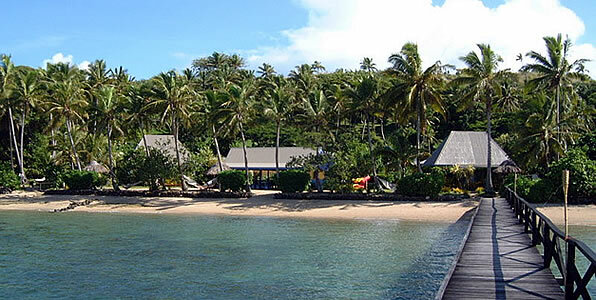 Compared to the ever popular Mamanuca and Yasawa islands, this place is very laid back. Enjoy uncrowded beaches (that are every bit as good as the finest in the Yasawas), and water sports activities that include windsurfing, SUP, snorkelling, diving, and game fishing. One of the things we really like about this island is that most places give you the chance to self cater. Instead of paying high rates for compulsory meal plans, the cottages are self contained with kitchen and cooking utensils. Just pick up some grocery items on your way to the island, and cook your own meals. If you are stretched for cash and even the cheap self catering cottages are a bit expensive for you (though at fj$150 a night average price it's pretty darn cheap), most of the properties have dorm accommodation. In our opinion, the best way to go is a bit of self catering, and mix that in with a pizza and a few meals at the local cafe to cut down on costs. Don't expect this island to be the same as the Mamanucas (a list of daily activities posted on a board each morning). You do as much or as little as you like, with water sports predominating. With reliable trade winds for kitesurfing, close to top class dive sites, and sheltered sandy beaches on the leeward side, this is a mecca for water based activities. Here are just a few of the highlights. * Divers - there are some terrific dive sites in close proximity to Nananu-i-Ra, which range from beginner to experienced. Several dive operators are based in this area and service all the lodges here, so just ask the staff at your accommodation. *Windsurfers and Kiteboarders - This is the place to be if you enjoy either or these sports, or want to learn. Safari Lodge run beginners classes, and you can hire all the equipment needed. *Snorkelling - there is snorkelling right off the beach. Swim at the end of the jetty, where the fish have become tame and will keep you company as you explore the corals. It is also possible to take a short boat ride out to some of the outer reefs for some exciting dives. *Fishing - either handline, or go out on one of the boats to chase Snapper, Rainbow Runner, Trevally, and Spanish Mackerel. *Sailing - Safari lodge have a 24ft catamaran, which they use for both day trips and overnighters. Get a party together, and head off to sail the islands in the area, exploring the hidden bays and beaches. If you are an experienced sailor then you can helm the "Seawind" yourself. Or if you are just learning, ask the captain to teach you the basics of sailing. One of the reasons that Nananu-i-Ra has not been quite as popular as (for example) the Yasawas is that you need to make more of an effort to get here. But it's worth it, that's for sure! Another reason is lack of promotion. You can't travel to a destination if you have never heard of it, right? But here at Fiji-Budget-Vacations.com, our mission is to bring your attention to the little out of the way places that you would otherwise overlook. While each of these lodgings have their own group of fans that return year after year (what does that tell you?) the island is somewhat off the radar as far as travel agents are concerned. And that really is a shame, because not only is this a fantastic destination in it's own right, the prices are well below what you pay in the "tourist corridor" to the south of Viti Levu. We are currently working with a Nadi tour and travel company (PVV Tours) to try and not only make your Nananu-i-Ra island stay even more affordable, but easy to get to as well. Once you have decided that you want to visit the island, and you have read our reviews of the lodges, check out our page on the PVV Tours Nananu-i-Ra special package. This package not only gives you cut rates on the accommodation, they also give you a bonus night in Nadi. So do check this out, it's not only cheaper, it's less hassle than making the arrangements yourself.